Does tree trimming help your tree grow? - Crowe Tree Service Inc. There are many reasons why tree pruning and trimming is beneficial and one of the most apparent is that you will increase your property value by beautifying your yard and making your home more attractive. There are benefits for your trees also in terms of their overall health. Having your trees professionally pruned will make them more healthy, productive and of course more pretty to look at. The additional benefit of tree trimming and pruning in Ottawa is that your trees will be safer for your family and the pruning and trimming will actually help them grow better. Furthermore, if some of your trees are fruit trees then trimming and pruning can help with fruit production from your trees. When you remove dead limbs from your trees, you are promoting better overall health in the tree, since dead wood makes the tree more susceptible to insect infestation and diseases that can harm the tree. The pruning and trimming process encourages the growth of spurs which will become fruit in the following year. One of the most important reasons outside of the overall growth of your tree is to remove hazardous branches that could fall on someone or something on your property. 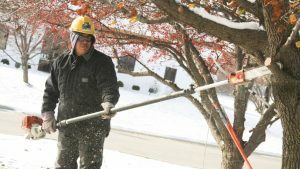 This is usually a good enough reason to have a professional arborist come in to help with your pruning and tree trimming however the added health benefits for your tree will hopefully push you toward making the phone call to have your tree trimming in Ottawa done this coming season. You see everything goes hand in hand. Tree trimming helps your tree grow and this ultimately makes your property more beautiful and safe. Dead wood and cracks in the tree, decay, cankers and poor root growth are all able to cause safety issues and can even lead to the death of your tree. Regular tree trimming in Ottawa will help to encourage the health and growth of your tree which will make your tree grow and remain strong – as well as improving the overall aesthetics of your yard. With all of these benefits it is something you should be adding to your schedule for the coming season by giving us a call at 613-978-TREE (8733) to book an appointment for your annual tree trimming service from one of our tree pruning specialists. Let’s work together to keep your trees looking great, healthy, and most importantly safe for everyone to enjoy.